Gift guide for the home: 1.Succulent kit with hand illustrated teacup planter (oh no rachio, $53.95), 2.Good luck porcelain horseshoe (Redraven Studios, $32), 3.Vintage soviet alarm clock (Petars Vintage, $58.90), 4.Winter woods natural soy candle (Opal and Wonder, $12.50), 5.Sage green and blue herb illustration tea towel (Yours is the earth, $18). 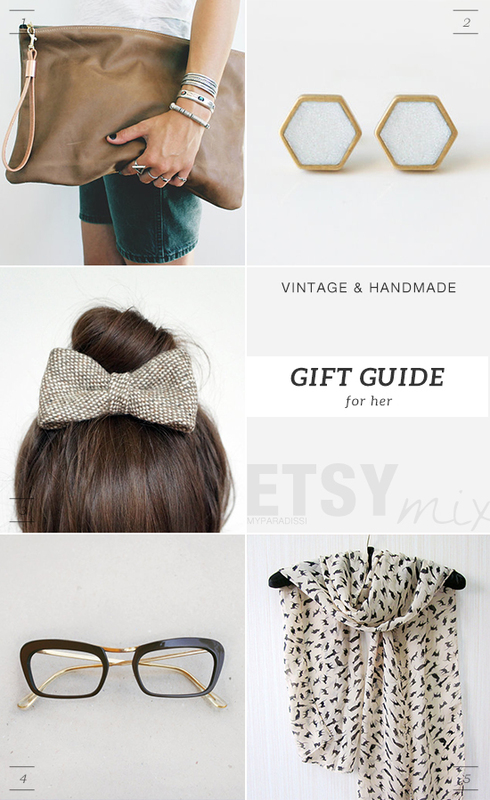 Gift guide for her: 1.Tonala grande leather clutch in brown (Scout & Catalogue, $142), 2.Crystal white hexagon stud earrings (Vivid by Esther, $15), 3.Vintage beige wool hair bow (Emma Lee Shop, $28), 4.Vintage cat-eye frames (Skomoroki, $84.73), 5.Cat scarf in beige (Kunscarf, $8.90). 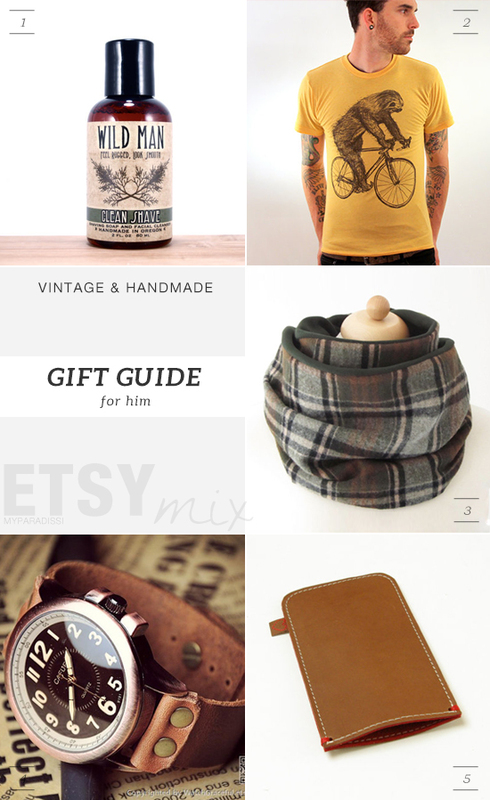 Gift guide for him: 1.Shaving soap face wash (Wild Rose Herbs, $11.95), 2.Tree sloth on a bicycle t-shirt (Dark Cycle Clothing, $24), 3.Men infinity scarf (Arten Vielfalt, $39.40), 4.Leather mens watch (Watch Glory, $18.99), 5.iPhone 5 leather cover (Westerman Bags, $39.54). 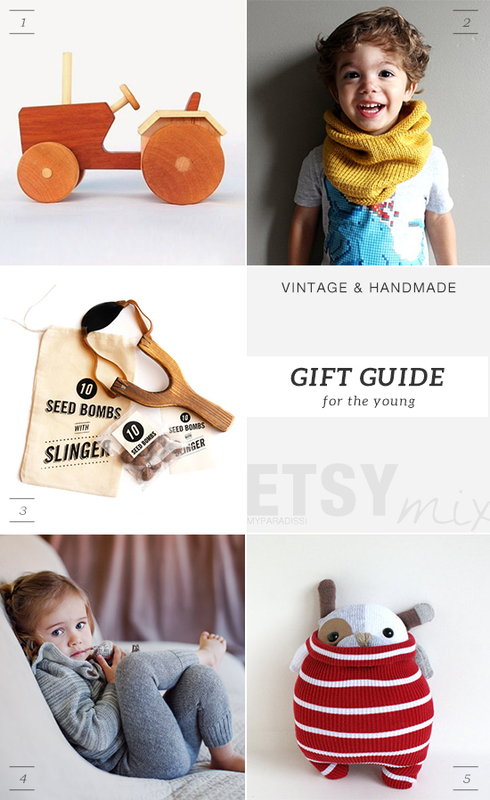 Gift guide for the young: 1.Wooden toy trunk (Wooden Toys Studio, $18), 2.Toddler knit cowl in mustard (The House of Hemp, $28), 3.Guerrilla gardening slingshot (Visualingual, $16), 4.Alpaca wool grey leggings (Ingugu, $62.14), 5.Little sockpup Patrick (the Remakerie, $42). Gift guide for the very young: 1. Handknit romper (Lalaka, $35), 2.White nursery mobile with bunnies (Upentitours, $140.46), 3.Black knitted Hi baby blanket (Yarning Made, $75), 4.Baby gold leather shoes (Ajalor, $35), 5.Grey pudgin plush doll (Camp & Company, $33.75). 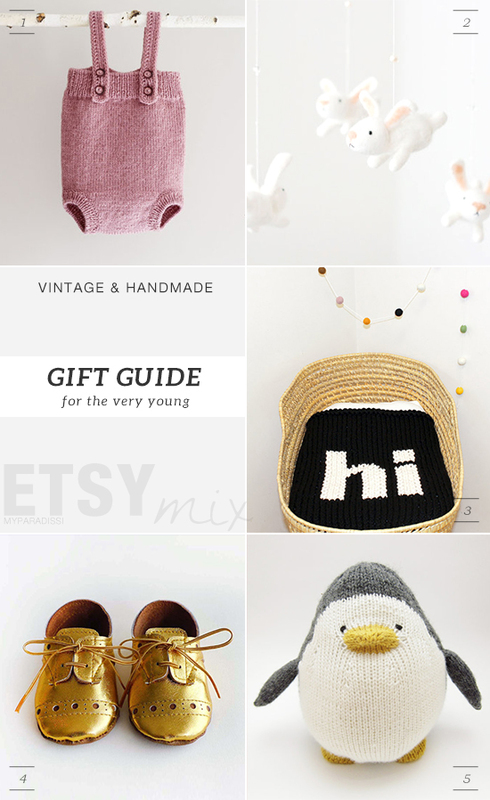 4 comments on "ETSY MIX: Holidays gift guides for all"
Wow—I love everything!! The kids picks are great. My niece would look adorable in those cozy leggings, and that "hi" blanket is too cute! ouu love it all! that succulent tea cup is awesome!! 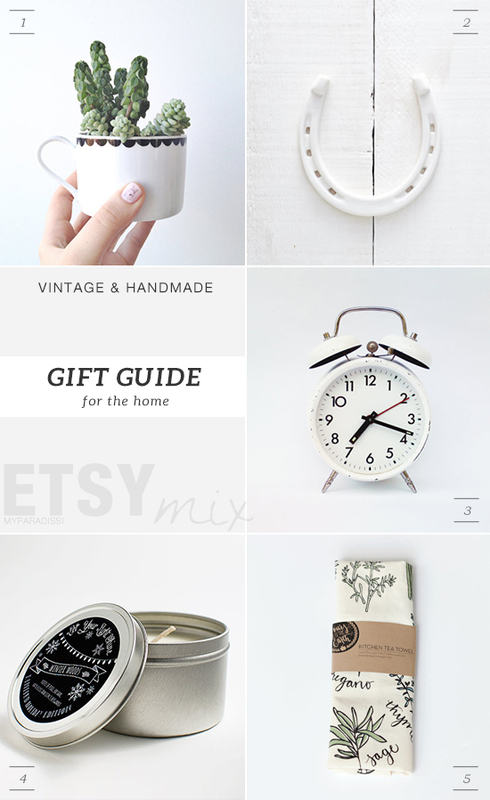 thanks for sharing, some really great gift ideas & i love the idea of getting things from small businesses on etsy!